In the Treatment Plan Module, with desired procedures selected, click PreAuthorization. A preauthorization is very similar to an insurance claim, except that when it is sent, the date of service is left blank. The insurance company reviews the procedures sent and decides whether they are covered under the patient's contract. They will send back a form with an estimate of how much will be covered for each procedure. Note: The Place of Service for preauthorizations can be edited on the claim. By default, preauthorizations in version 16.4.32 or greater and 17.1.3 and greater inherit the Place of Service from the last procedure in the preauthorization claim. In earlier versions, the first option under Default Place of Service in Practice Setup is used by default. In the Chart Module, treatment plan the procedures. In the Treatment Plan Module, highlight one or more procedures by pressing Ctrl while clicking. In the Toolbar, click PreAuthorization. If there is only one insurance plan, proceed to step 4. 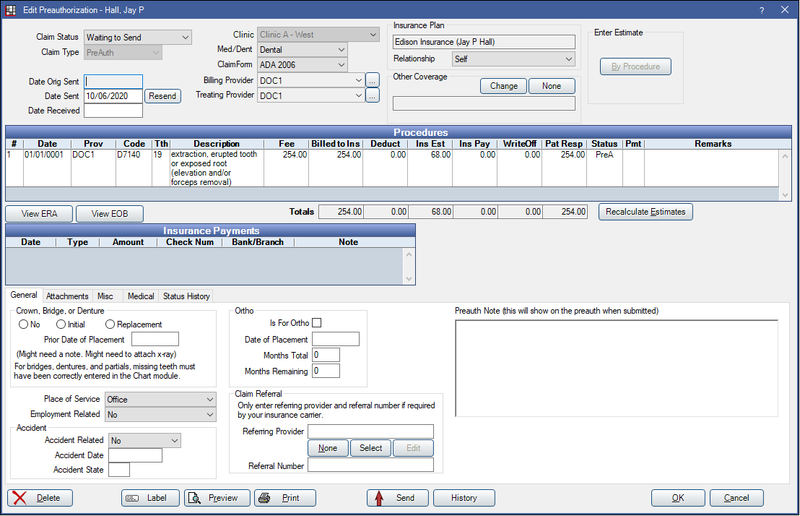 Select the plan the preauthorization is for, and the relationship of the patient to the plan subscriber, then click OK. Note: To list all insurance plans for the family, including inactive or dropped plans, check Show plans for family which are not in use by the current patient. On the Edit Claim window, click OK.
Print or send the preauthorization electronically. Once sent, only users with thePreAuth Sent Edit permission can make edits. Preauthorizations for a patient are listed in the top right of the Treatment Plan Module. When you click on a preauthorization, all procedures attached to that preauthorization will highlight for easy viewing. Double click to view or edit on the Claim. Other Coverage: Set other coverage (e.g. secondary coverage) after you create the preauthorization. Open the preauthorization, then at the top of the Edit Claim window, click Change next to Other Coverage. This option can also be used to set primary coverage if this is a preauthorization to a secondary insurance plan. Double click on the preauthorization. Click By Procedure in the upper right. Click in the Estimate cell to enter the estimate given on the EOB. For reference, enter the preauthorization number sent by the insurance company and any remarks. When you create the final claim on the Edit Claim window, you will need to enter the number from the preauth note in the Predeterm Benefits field. The estimates will flow into the patient's treatment plan estimates. Check Preauthorization Status: Check the status in the upper right of the Treatment Plan module, or use the Outstanding Insurance Claims Report and include preauths.